The R&F Hot Plates are the perfect tools for working with encaustic paints. They provide a platform on which to keep knives and brushes warm and ready for use. They also make a great heated surface for mixing colors. 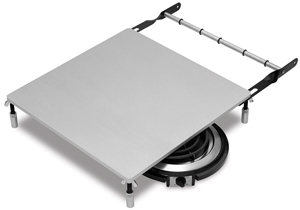 This Hot Plate features adjustable legs and also includes an attached brush holder. Hot Plate, 16" × 16"